We had created a new list page which had to appear inside the Timesheet Quick Launch Menu. The problem with the deployment was there was no option to deploy inside the Timesheet node, and if the list page was deployed under the EmployeeServices node, the user would lose the Quick Launch Menu each time the url was clicked. Step 3. Right click the WebURL menu created and import the page. Step 5. 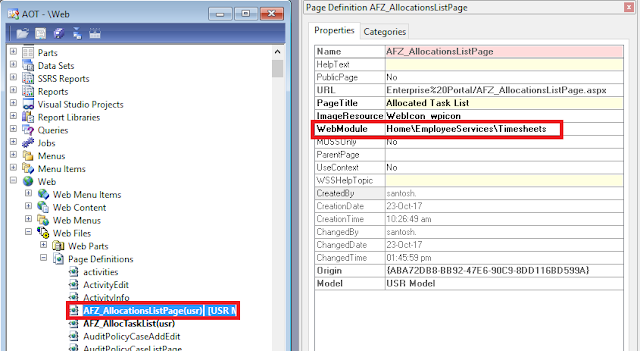 Now right click on the Page Definition and deploy the page to the new address that has been specified. Step 7. At this stage the WebURL can be added to the quick launch menu created for timesheets, and when this link is click it would open with the left navigation pane in place as shown below.